KIEV, Ukraine -- About 6,000 people gathered in Ukraine's capital Thursday on the fourth day of demonstrations against tax law changes, part of the largest nationwide wave of protests since the Orange Revolution of 2004. Protesters shout slogans protesting a draft tax law in Kiev, Ukraine, Thursday, Nov. 25, 2010. About 6,000 people gathered in Ukraine's capital Thursday on the fourth day of demonstrations against tax law changes, part of a nationwide wave of protests that is the biggest since the Orange Revolution of 2004. Flags give the names of towns, regions and organizations protesters are from. The demonstrators set up tents in Kiev reminiscent of the encampments of the Orange Revolution, which brought in an era of tumultuous democracy in Ukraine. Parliament adopted the new tax bill last week, but President Vikor Yanukovych is hesitant to sign it, fearing it would take a serious toll on his popularity. He offered to meet with the protesters later this week and take their demands into consideration. Iryna Akimova, Yanukovych's deputy chief of staff, said parliament will submit the bill to Yanukovych on Friday. The government says the reform is a long-overdue measure that will streamline tax legislation, increase budget revenues and help fund pensions and other social programs after the economy contracted 15 percent last year. Experts agree that Ukraine must reform its tax system, which currently ranks among the three worst in the world, according to a study by the World Bank group. But other experts and entrepreneurs say the tax law changes would cripple small- and medium-size businesses by depriving them of much-needed tax brakes. They say the new tax code will actually decrease government revenues by drowning many businesses and will fuel corruption among tax police by giving tax inspectors too much power when inspecting firms. Some 3,000 protesters rallied in front of the president's Office late Thursday. A group of them was allowed inside to speak with Akimova. The protesters also staged demonstrations at the Prosecutor General's offices and Central Elections Commission headquarters, accusing officials of abusing power and demanding an early vote to oust the Cabinet. 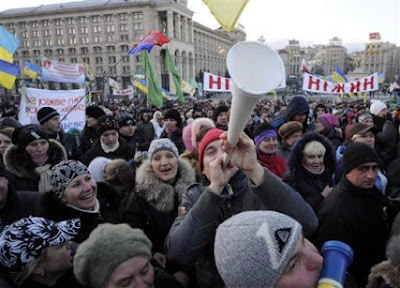 "They have declared war against the people," said co-organizer Oleksandr Danylyuk. Some 1,500 police were on duty to keep order at the Kiev demonstration. No violence was reported.